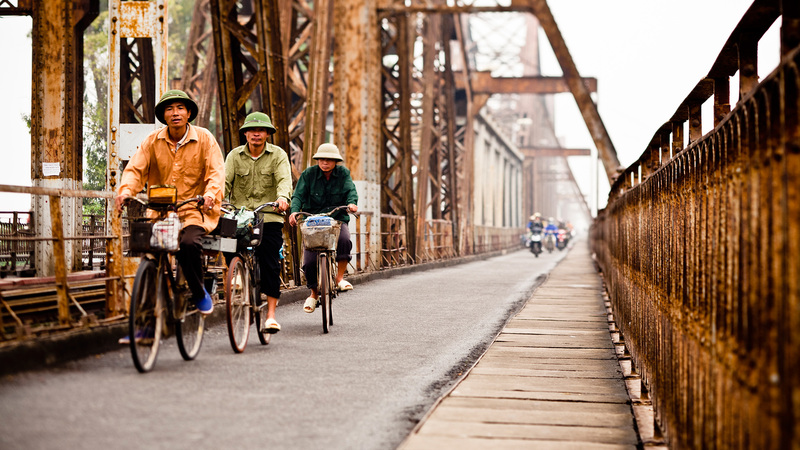 “Hanoi” - the name means “surrounded by river” is the city of ponds, lakes, rivers and bridges. If Hoan Kiem Lake with special green water and the red bridge named The Huc is the symbol of an elegant and charming ancient city; Red river and Long Bien bridge may be seen as the symbol of courageous capital in wars. The bridge was formerly named Paul Doumer by the French, but Vietnamese have called it Long Bien or Cai River Bridge for a long time, and Long Bien becomes the most popular name of the bridge. Originally, Long Bien Bridge’s complex 19-span, 20-column cantilever design was immediately fêted as a technological masterpiece, and it was the first steel bridge across Red river in Hanoi, and one of four greatest bridges in the world at the time it was built. “It is one of the longest bridges in the world, its total length being 1,680 metres (5,505 feet). According to Doumer’s memoirs, the engineers who constructed it were Messrs Daydé et Pillé, Creil (Oise) and the superintendent engineer in charge of its erection informed us that his task had been very difficult owing to the subsidence of the soil and the bed of the river. The earthwork leading up to the bridge had sunk three times, to a total depth of three metres, but he thought that was final. The stone columns, 14 metres high, are built up on metal cylindrical piles, 30 metres deep, which are filled with cement. There are 20 stone columns and some idea of its dimensions may be gathered from the fact that it absorbed 80 tons of paint, and the total weight of the steel is 5,000 tons. It is a magnificent work of which the French colonial government may well be proud, as a feat of modern engineering skill, and as a colossal monument to their desire to improve the communications between the provinces and the capital”. Long Bien was considered the pride, symbol of architecture in the Far East. 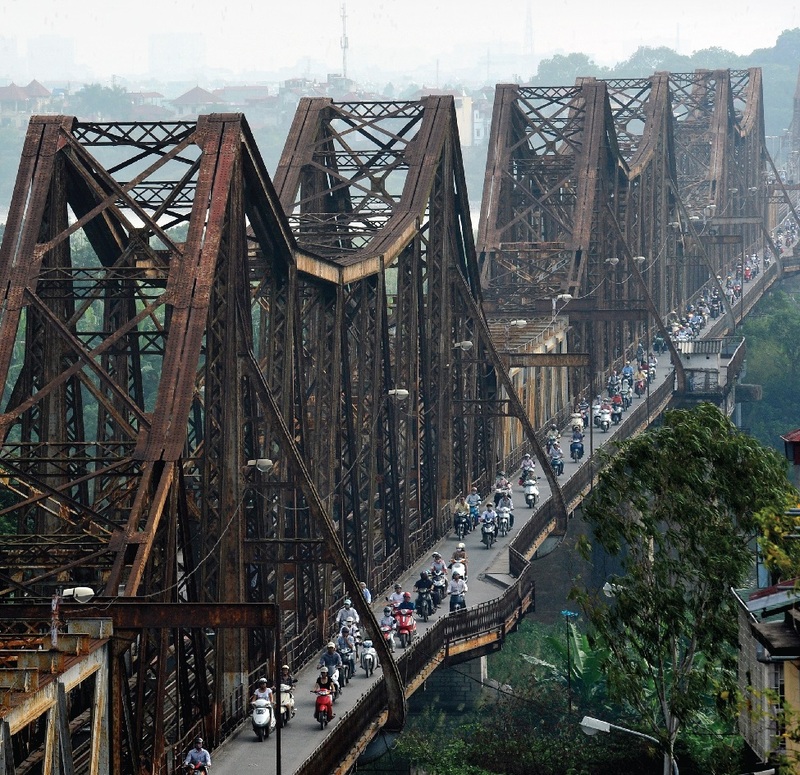 The bridge’s links with revolutionary history began in the period immediately after the First Indochina War, when the French used the Hà Nội-Hải Phòng line to evacuate their civilians and troops. It was across the Doumer Bridge that the final contingent of French soldiers walked on the afternoon of 9 October 1954, after withdrawing from the Hà Nội Citadel. The Việt Minh then took possession of the bridge, officially renaming it Cầu Long Biên. On the morning of 10 October 1954, Việt Minh troops entered the city, declaring the capital liberated. Its strategic function later made the bridge a key target for US bombers. In March 1965, as the Americans unleashed their sustained aerial bombardment known as “Operation Rolling Thunder,” anti-aircraft guns were installed on the central bridge towers. 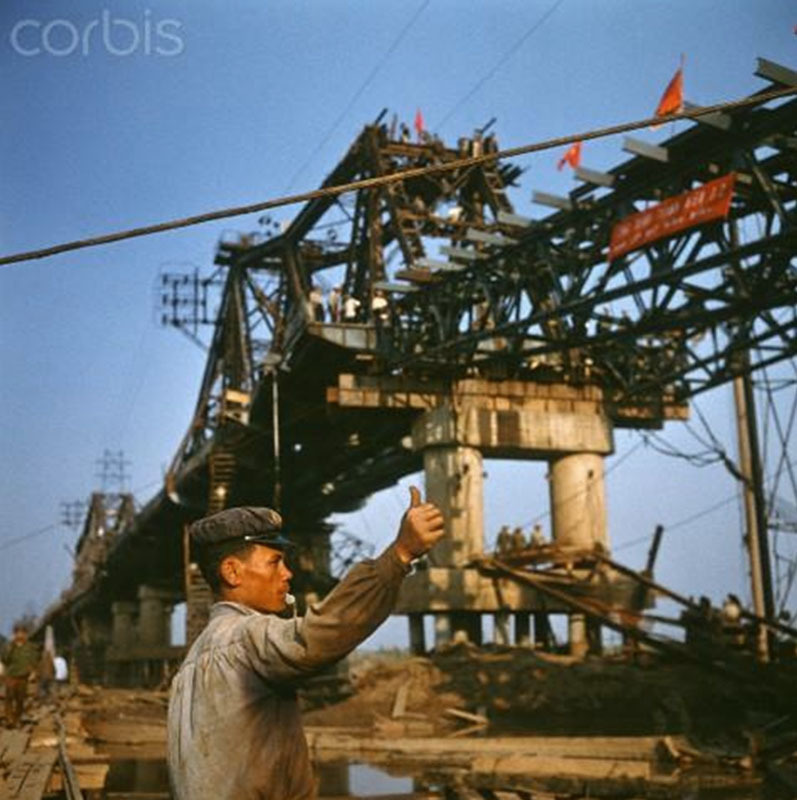 However, in 1966-1967 the bridge was hit on no fewer than 10 occasions. 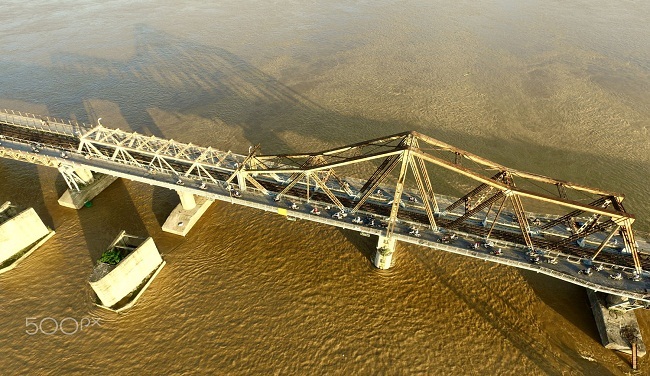 At first, running repairs succeeded in keeping it open to rail traffic, but in August 1967 the central span was destroyed, severing the vital rail link across the Red River. During the ensuing eight-month reconstruction period, an extraordinary floating bridge known as SH1 (Sông Hồng 1) was installed to maintain rail transport between Hà Nội and Gia Lâm – barges were used to move the pontoons into place at night and then float them away again before first light. Nixon’s “Operation Linebacker” of May–October 1972 inflicted further damage on the Long Biên Bridge by hitting it on four occasions, demolishing three more spans and once more severing the vital rail link between the capital and the north. As before, a pontoon bridge system – this time known as SH2 – was hastily installed across the Red River to reconnect Hà Nội with Gia Lâm. Altogether, seven spans and four support columns were destroyed during the American War. 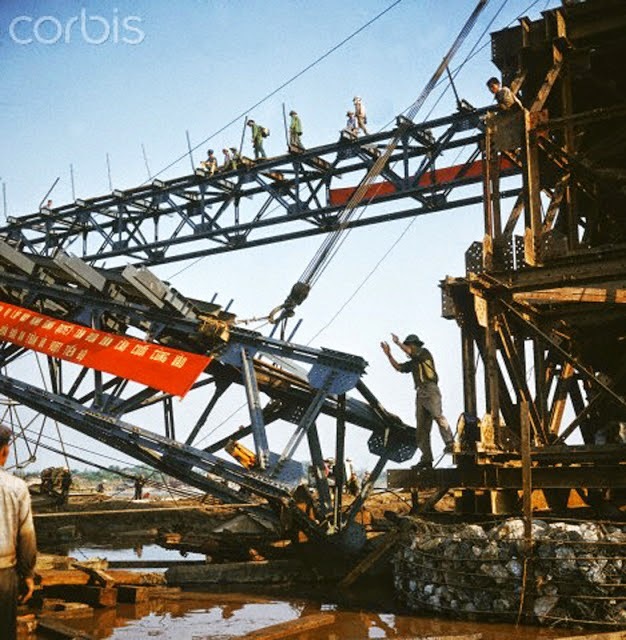 After the Paris Peace Accords, work began to rebuild the bridge using steel supplied by the USSR, and by March 1973 trains were once more running through from Hà Nội to Gia Lâm junction. Since the need to ensure architectural integrity was not high on the agenda, those wartime reconstructions left only half of the bridge with its original shape. 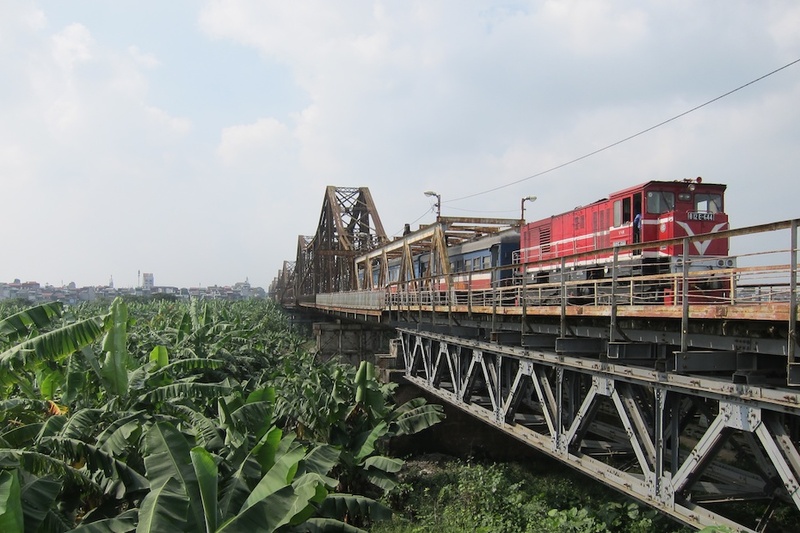 The current debate over the bridge’s future stems from proposals elaborated nearly a decade ago to establish a fully integrated public transport system in Hanoi, incorporating outer and central suburban railway lines run by Railway Station, citywide bus services and a five-line Metro network. This ambitious scheme demands the provision of a multi-track railway bridge to carry the main line, Metro Line 1 and the proposed central suburban line across the Red River. Back in 2007, the French government pledged financial support to “restore the bridge to its original appearance.” But perhaps the last word should go to William Logan who, in his 2000 book Hanoi: Biography of a City, argues that while the Long Biên Bridge was a remarkable French engineering and architectural achievement, it is the bridge’s misshapen, unrestored spans which make it such a special symbol of the indomitable Hà Nội wartime spirit. As of 2015, only $150,000 was reportedly being spent annually on around 80 workers to scrape rust, repaint, clean and replace sleepers and fasteners. It is the only bridge in Hanoi where all the riders have to go in the left hand side, where tourists can take a walk and taste mouthwatering desserts offered by vendors (see 5 street vendors you should not miss out in Hanoi), where Hanoians can buy fresh vegetable or fish for the dinner from the small afternoon market on the bridge. Many people living and visiting Hanoi said that Long Bien Bridge is the best place to look at the sunrise or the sunset and taking nice photos of alluvial patch. 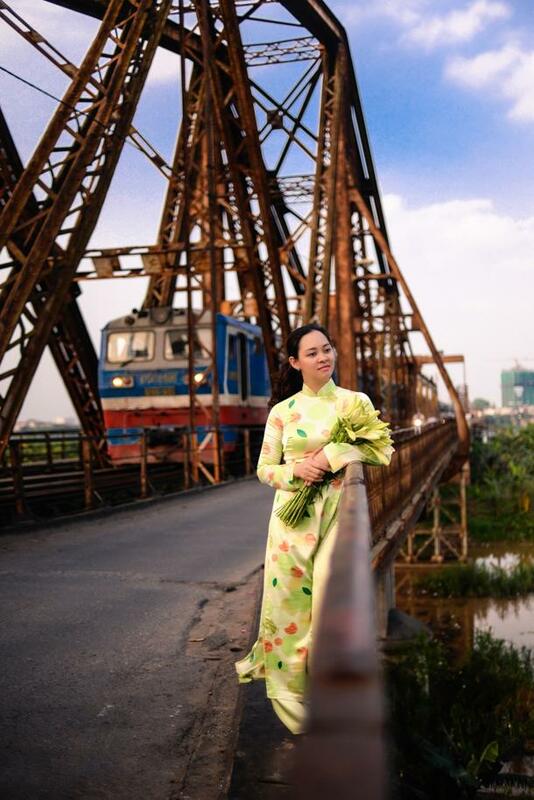 Many brides and grooms choose Long Bien Bridge as nice background in their wedding albums. Many tourists come here to visit a historical construction and view nice scenery. Many youngsters, teenagers take nice photos to keep memories of youth on the bridge or in the middle of alluvial patch with full of green tree. Many vendors and housewives still come here every afternoon for an open air market. And many trains pass the bridge each day. You can rent a motorbike and remember go on the left hand side of the bridge, or walk from the centre of Hanoi to here ( just more then 1km from the Old Quarter to Long Bien bridge). A comfortable spot to appreciate the bridge and take photos is rooftop Cafe Serein (16 Tap The Ga Long Bien, Tran Nhat Duat, Hoan Kiem: T: (093) 644 6221)). Have an indoor floor too; take a lift from the empty ground floor up. They offer teas, coffees, juices and other drinks (mostly around 35,000 to 55,000 dong).